Andi Eigenmann Leads 'The Beauty Awards' of Sense & Style Mag! 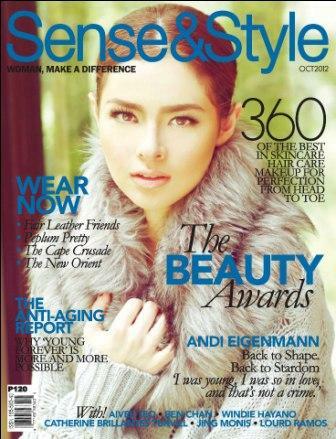 Andi Eigenmann is the cover girl of Sense Style Magazine for the their October 2012 issue. She banners the so-called "The Beauty Awards" edition of the said magazine. Andi is currently seen in the Primetime teleserye "Kahit Puso'y Masugatan." She is also fresh from the success of her movie "A Secret Affair" a movie under Viva Films pairing her with Derek Ramsay.